Thinking about getting a DVD drive for the computer? Maybe one for the home and one for the Laptop? 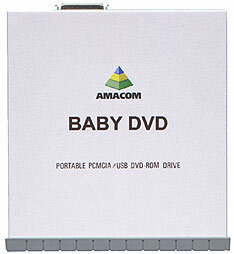 Well the Baby-DVD from Amacom would allow you to do just that - with just one drive... This small CD/DVD-drive is about the size of a portable CD-player, and can be attached via PCMCIA port without the need for external power cords. Ultra portable, the drive can also be used on the home PC via USB cable. The Baby DVD incorporates a Toshiba drive in a stand alone metal enclosure which can be connected to both PCMCIA and USB ports, offering the best of both worlds. The drive comes with instructions, a driver diskette, a CD ROM of bundled software including Power DVD, and an audio line adapter cable. Our first impressions of the drive itself were very high; the drive is small and feels very solid in its metal enclosure. Our testing drive also came with the optional USB kit, which contains a 100-240V AC/DC adapter, USB adapter cable and drivers. When the drive is connected via a USB port it requires a separate 5 volt power supply (delivered by the AC-adapter) in order to work. When connected via the PCMCIA port, the DVD is powered by the port alone. The USB kit essentially makes it easy to transition the Baby DVD from laptop to home PC. The idea being, the drive is simply disconnected from the home or office PC and carried along with the laptop for a trip or meeting.